I wrote at the end of my entry for the Go! St. Louis Half Marathon that I ended the race with a pain in my lower back. What I didn’t mention with the purpose of quelling any concern amongst family members, was that the pain was borderline excruciating. Standing up and sitting down were tasking motions, lifting my left leg any farther than three feet was to be avoided, and sitting down for longer than an hour on a desk chair meant preparing myself for retribution. So in spite of having run my fastest half marathon, it was clear that my spirits were down. Had my training taken a subtle wrong turn? Was this the injury that would kill my hopes of running ten half marathons this year? Was I doomed to the elliptical forever? For a crazy person with the running bug, these are legitimately scary questions and I was set on getting through the agony. I took an entire week off. Taking the stairs at work was the only exercise I let myself do, hanging up my running shoes for the time. The pain subsided very slowly, but eventually it was gone. Two weeks later, I was running in Lancaster, Pennsylvania, (a deceptively hilly town) where I realized that my back was complaining with every downhill. I’m not a physical therapist but I decided that I had discovered the source of my pain. I guess I need to practice more downhills. 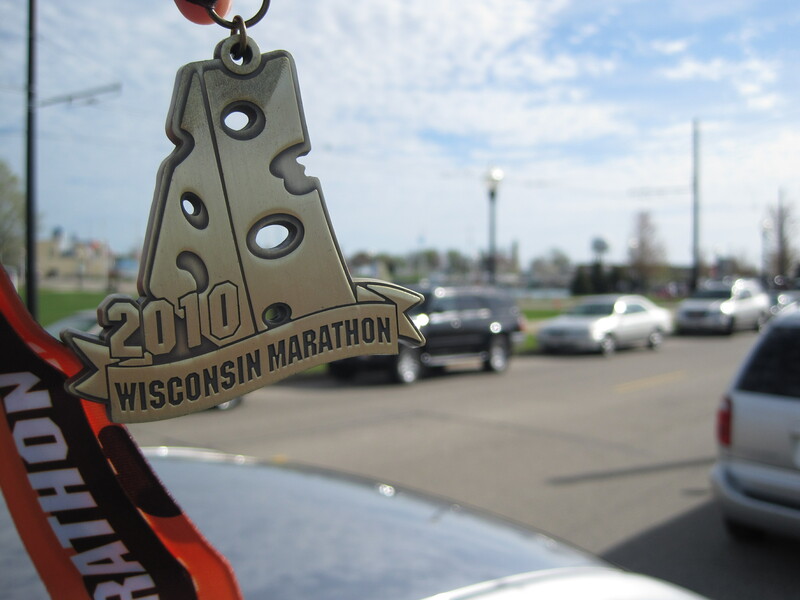 Running woes behind me, I arrived in Wisconsin for the Wisconsin Half Marathon Friday night, ready to scarf down plateloads of pasta at Buca di Beppo thanks to the hospitable graces of my little gentleman, Baxter. 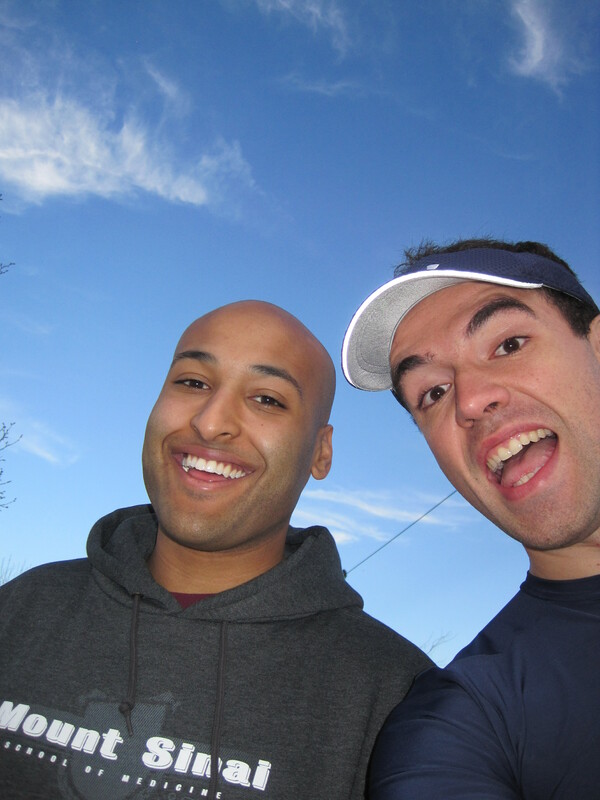 Between the summers of 2007 and 2008, we roomed together on Clifton before he graduated and went off to Waukesha to work for GE. Since then, he has come down to Chicago several times to hang out with us, but this was the first time that I had visited him. Saturday morning was overcast and breezy with temperatures flirting with 60 degrees. There was rain on the horizon, but it never reached Kenosha, which is where the second annual Wisconsin Marathon and Half Marathon was held. I made my way to my pace starting corral, just behind the all-cheese corral, which is made up of people in cheese hats, cheese shirts, or just people wearing all-yellow. Truth be told, it’s unlikely that runners bedecked in cheese apparel were the fastest people on the course, so the very beginning of the race required a bit of crowd negotiation. The course begins on a grassy extension of land by the lakeshore, where one can find the Civil War Museum. From there, it heads right into the city of Kenosha, and then south into residential areas that reminded me of those found in Evanston just south of Northwestern. The course runs about 2.5 miles down to 78th street and turns around, heading back into the city and through a harbor to reach a lakefront path around mile 5. From there, it continues north to run on 32. Though I had been sweating since mile 2, I felt full of energy. The course turns around just before mile 8, where I decided to start increasing speed. I’ve never been able to run a fast second half. I always start off the race too fast and burn out by mile 10, clocking significantly slower splits. I sometimes fear that it’s becoming a psychological thing, as if just the thought of reaching mile 10 sends an instant rush of fatigue into my muscles. Like a true running nerd, I’ve even graphed my results and have found the same downward sloping trend in speed in almost every race. But not this time. I kept going, recording times not seen in the first half, including my fastest half marathon mile ever (7:26) at mile 13. At the final stretch, I caught up with a young man who had started just before me. Seconds after I passed him, I saw his shoulders in my periphery – he wasn’t going to let this skinny kid beat him. I turned to my new best friend and emphatically yelled “Let’s do this! Let’s – do – this!” and broke into a sprint. 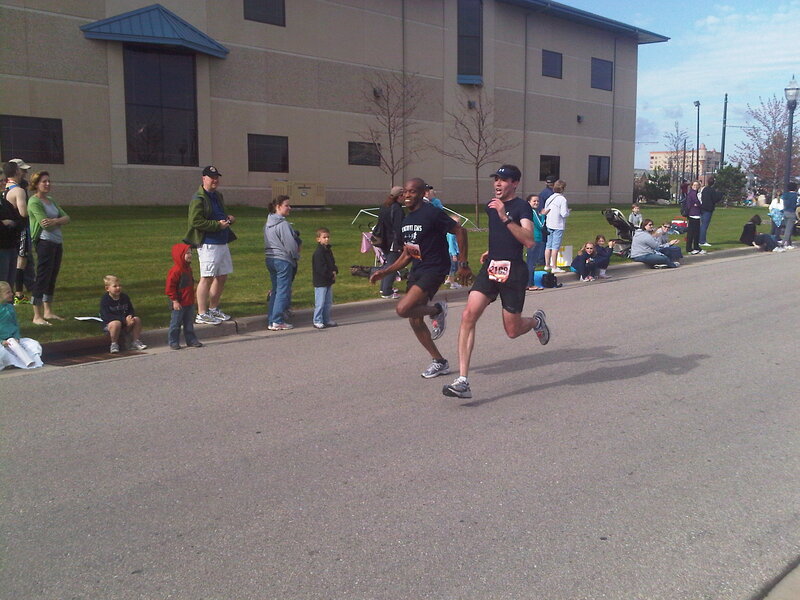 He passed me in that final sprint, but I didn’t care – I had recorded a personal best of 1:43:53. With this formidable PR under my belt, Baxter and I drove back into Chicago. My elation of having broken the 8:00 pace threshold scarcely let me appreciate my lower back, which wasn’t complaining one tiny bit. This is a great thing for many reasons, but mostly because I had only one week to recover and deliver an acceptable run at the OneAmerica 500 Festival MiniMarathon in Indianapolis. I was glad I got a chance to see Baxter, because he left Wisconsin to attend Mount Sinai Medical School in July, where he’ll be spending many long and rewarding years earning an MD.